The “live oak” is an evergreen oak known for its strength and long life. It has been a symbol of revitalization since ancient times. 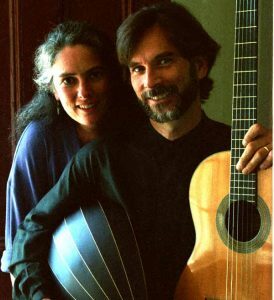 Duo LiveOak (Nancy Knowles, soprano and Frank Wallace, guitarist/baritone/composer) performs the great song repertoire from the middle ages to contemporary, accompanied by the guitar and its ancestors. In concert, LiveOak is known for its versatility, grace, and spontaneity. They sing and play with passion and drama, combining rich vocal harmonies, virtuosic playing, and acting skills to create performances that transcend the standard recital format. LiveOak made its name in medieval and renaissance music in the 1980s and early 90s. In the last decade Frank Wallace has become a formidable composer of music for solo classical guitar, and most recently, of songs with either guitar or lute accompaniment, often with Knowles’ poetry for text. This body of new work, contemporary in style, but with echoes of ancient music, is now a major feature of the Duo‘s performances.Both as a duo and as members of the early music ensemble LiveOak and Company, Wallace and Knowles have toured widely throughout the U.S. and Europe since 1976, performing at festivals such as the Holland Festival, the Regensburg Festival, Música en Compostela, and the Boston Early Music Festival, and the Barcelona Festival. LiveOak was a member of the New England Touring Program roster for many years and is now on the New Hampshire Touring Program. Although their main focus has shifted in recent years to duo work, Knowles and Wallace still occasionally perform with other colleagues (Mary Graham, harpist; Jane Hershey, violplayer; Grant Herreid, lutenist/winds/tenor, Steven Yakutis, actor/baritone, and others) as LiveOak and Company. LiveOak has recorded for Titanic, Centaur, Musical Heritage Society, and most recently, Gyre. Frank Wallace won the coveted Artist Fellowship Award of the New Hampshire State Council on the Arts for his playing and composing on his new solo guitar CD, Frank Wallace: his own new works (Gyre 10012). In July of 2001 Duo LiveOak released their first CD of 19th century repertoire with historical guitars, Schubert and Mertz (Gyre 10022). Four more duo and solo CDs are in the final stages of editing and production to be released 2001and 2002. Their first recording was the self-produced quintet recording LiveOak Live in 1978, followed by two trio LPs of Spanish music of the 12-16th centuries on Titanic Records in the early 80’s. Their first CD, The Lost Spindle: Theatrical Music from the Courts of Ferdinand and Isabella was released on Titanic in 1989 and again on Musical Heritage Society in 1994. Three more CDs (solo, duo, quartet) came out on Centaur Records in the 90’s. In 1979, with a desire to experience medieval music in a medieval acoustic, Trio LiveOak (the late John Fleagle, Nancy Knowles, and Frank Walllace) established their international reputation with in a most unusual manner, by following the ancient pilgrimage routes on foot over the Pyrenees mountains from the French border to Montserrat (near Barcelona). For four weeks the trio trekked through the mountains and villages of the province of Catalunya with a few instruments on their backs and enough vocal power to fill the gorgeous romanesque churches that grace every village and hilltop. Always greeted with amazement and enthusiasm, the trio returned a month later to follow their route by train and car in a formal concert series. The tour ended with a packed Santa Agatha church in the barri gotic of Barcelona. The trip caught the attention of journalist George Semler who wrote about the young trio in the International Herald Tribune. Guitarist/baritone/composer Frank Wallace has been widely recognized for his extraordinary talent not only as a player of the classical guitar and its 19th century predecessor, the romantic guitar, but also as a master of self-accompanied song. He is in addition a leading performer on the vihuela de mano. 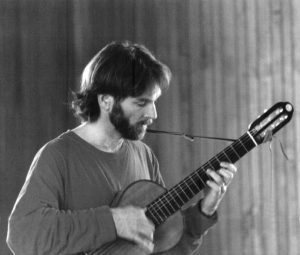 After graduating from the San Francisco Conservatory in 1974, he taught classical guitar at the New England Conservatory before pursuing a full-time career in early music performance with LiveOak in the early eighties. As a composer/arranger, Wallace has published several works for classical guitar as well as intabulations of Spanish and Flemish renaissance song (Gyre Music). His work The Stubborn Oak for solo classical guitar was published by Tuscany Publications in October, 2000. His most recent work includes a new suite for solo guitar, a song cycle for baritone and lute/vihuela entitled Voices in the Dark, a song cycle to a poem by Nancy Knowles, for soprano, baritone and lute, called Pearly Everlasting and A Single Veil, a song cycle for soprano and classical guitar. The latter was premiered at the Guitar Foundation of America Festival in La Jolla, California in October 2001.Nancy Knowles, soprano, a singer/actress since a young age, is also a talented visual artist and poet. As artistic director of LiveOak and Company, she has conceived a number of highly-acclaimed shows, including the fully-staged dramatic production The Lost Spindle. Her most recent work in this vain is The House of Fools a dramatic memoir in two acts. The show combines Knowles’ own poetry with masks, flutes, drums, and unaccompanied song, including medieval, Shaker, Peruvian and early blues. 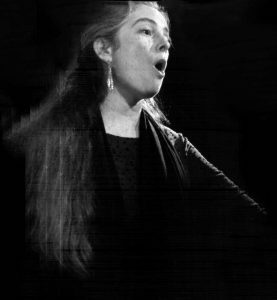 As teacher and as performer, Knowels works with the voice in both speech and song, giving workshops in singing and performance skills as well as giving solo concerts combining her own poetry with women’s songs through the ages. Knowles and Wallace live with their two teenage sons in the scenic Monadnock region of New Hampshire. In addition to their touring, they teach guitar and voice locally at the Two Rivers Music Studios in Peterborough and in Antrim. They run occasional workshops at their home.